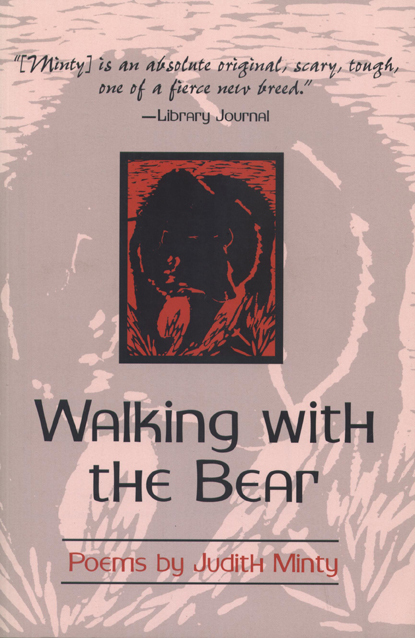 Walking with the Bear is a life work-a past, present, and future of renowned Michigan poet Judith Minty's work over the last thirty years. In essence, Minty is writing one long poem from the moment she begins her journey, taking us with her on this road with her intimate vision. Beginning chronologically with selected work from Lake Songs and Other Fears (1974), Yellow Dog Journal (1979, 1981), Letters to My Daughters (1980), In the Presence of the Mothers (1981), Counting the Losses (1986), and Dancing the Fault (1991), Walking with the Bear then continues with new poems, bringing us along the shifting, but never-ending path of Judith Minty's poetry. Judith Minty is the author of four full-length collections of poetry and four chapbooks. Her first, Lake Songs and Other Fears, was a recipient of the United States Award of the International Poetry Forum in 1973. Her prose and poetry has appeared in over fifty anthologies and in numerous magazines and journals. Minty is also a recipient of the Eunice Tietjens Award, the John Atherton Fellowship to Bread Loaf, Villa Montalvo Award for Excellence in Poetry, two Michigan Council for the Arts Creative Artists Grants, two PEN Syndicated Fiction Awards, and the PEN/Mead Foundation California Fiction Awards.